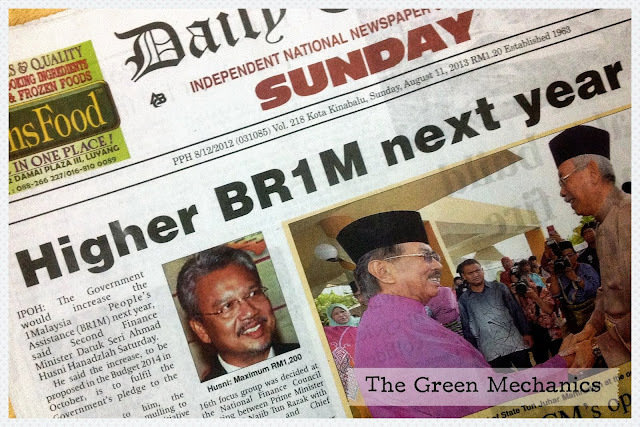 This is about BR1M or 'brim' - the 1Malaysia People's Assistance or Bantuan Rakyat 1Malaysia. BR1M of more than RM500 would be given to the deserving citizens next year. They are planning to increase this to RM1,200 within a span of several years during the current government's term. This kind of candy is NOT SUSTAINABLE and is unfair to the genuinely deserving citizens. I totally disagree with such expenditures. They could spend the RM5 billion to RM10 billion on providing basic infrastructures in the rural areas such as road and electricity. After all, these are the target areas for the BR1M.